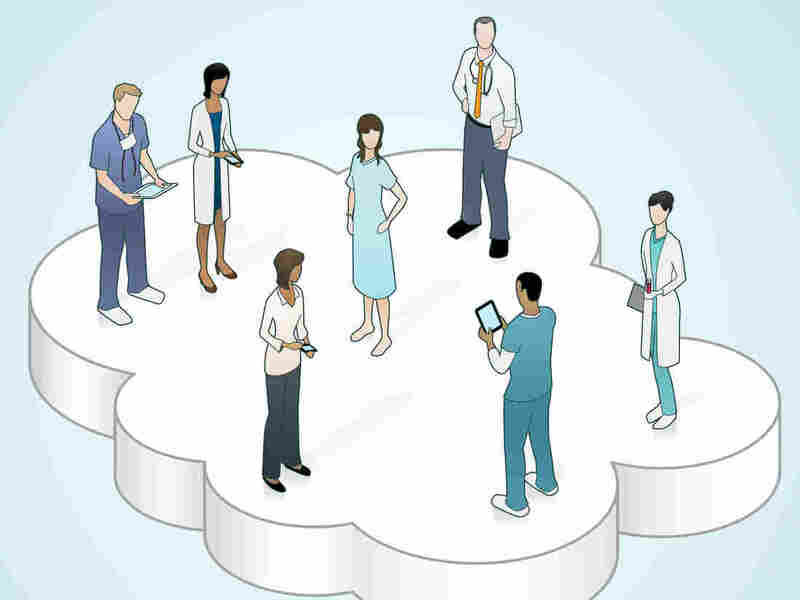 Cloud Computing Saves Health Care Industry Time And Money : All Tech Considered The cloud's vast computing power is making it easier and less expensive for companies and clinicians to discover new drugs and new medical treatments. Analyzing data that used to take years and tens of millions of dollars can now be done for a fraction of that amount. Researchers are increasingly using cloud computing to discover new drugs and medical treatments. Cloud computing is often cheaper and quicker than in-house computing. The cloud's vast computing power is making it easier and less expensive for companies and clinicians to discover new drugs and medical treatments. Analyzing data that used to take years and tens of millions of dollars can now be done for a fraction of that amount. Most of us know Amazon as the world's largest online retailer. But its cloud computing business is booming too. Companies can rent massive computer resources by the hour, and the cost is relatively little. The ability to analyze vast amounts of data in this way is changing lots of industries — including health care. Dr. Michael Cunningham is doing rounds at Seattle Children's Hospital. As medical director of the hospital's Craniofacial Center, he sees young patients whose skulls have fused prematurely. Greenpeace: How Clean (And Green) Is Your Cloud? "The biggest obvious consequence of having craniosynostosis is that your head shape gets very abnormal and it increases the pressure inside the skull, having potential to damage the brain," Cunningham says. The disease seems to be caused by an abnormality in the way bone cells communicate, but Cunningham wanted much more information. And researchers, working with a huge amount of data stored in the cloud, were able to identify patients whose cells looked similar. "It's the first thing that's ever been found that really gives us a clue as to where to look in terms of underlying cause," Cunningham says. That should help in coming up with better treatments. Aided by cloud computing, researchers crunched, analyzed and sequenced massive amounts of information — something Cunningham could not have done on his own. It would have been far too expensive and taken too long. Work like this is going on at Google, Microsoft and other places too, but Amazon is the leader. Think of the cloud as a giant warehouse full of computers of all sizes and shapes. Matt Wood, head of scientific and technical computing at Amazon Web Services, says pharmaceutical companies are saving money by renting only the computing power they need, and paying for it by the hour. "We have customers that are running very large-scale drug discovery pipelines," Wood says. One customer, for example, wanted to run a virtual screening of 21 million chemical compounds. "So you can imagine 50,000 laptops running this experiment. They didn't have to buy or provision or manage or cool or power any of those laptops, or set them up. They could just provision what they needed at a scale that they needed it," Wood says. The entire experiment took about three hours, and the cost was less than $15,000. In contrast, Wood says, if the company had tried to do this in-house, it would have had to spend millions on computers, and the job might have taken years to complete. "So it really is transformative in the way that it can accelerate the drug discovery process, in the way that it can accelerate the scientific discovery process," Wood says. Forrester Research analyst James Staten says cloud computing is gaining wide appeal in the drug industry. "Nearly every pharmaceutical company we speak to, at least in the [research and development] part of their business, is doing this," Staten says. "Given the economic change that this creates for them, it's extremely attractive." What's more, when information is stored on the cloud, it's easier for researchers to collaborate. Dr. Stephen Friend, president of nonprofit Sage Bionetworks, says that even rival pharmaceutical firms have an incentive to share ideas and information. "They're trying to develop their drugs for lower cost, and so pharmaceutical companies love the de-risking that occurs by having much of the data be available for everyone to look at," Friend says. Already, consumers are reaping direct benefits from cloud computing. Staten points to the company Pathwork Diagnostics, which has put a huge amount of information about cancer tissue in the cloud to speed up diagnoses. "If a new tissue sample is submitted to them from a doctor who doesn't know what kind of cancer it is, they can put that single sample into their database on the cloud and, within less than a day, come back with a high-probability diagnosis of what kind of cancer that tissue sample is," Staten says. And that would help a doctor decide on the most appropriate treatment. Amazon won't say how much revenue it makes from cloud computing. But estimates put the number at about $1 billion per year, and it's growing quickly. Indeed, the company's cloud services may ultimately eclipse Amazon's retail sales.